All Star Flags is proud to carry the Flag of Honor. The 3x5' Flag of Honor is made of heavy-duty nylon material with a canvas header and brass grommets. The Flag of Honor comes with a commemorative 8x10" poster. 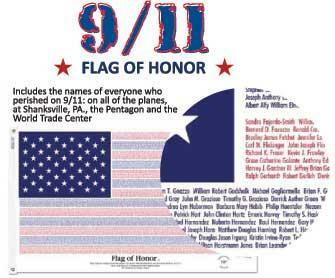 This official 9-11 Remembrance Flag was created with the sincerest intentions of honoring the victims of the terrorist attacks of September 11, 2001. The goal is to immortalize each individual victim, to give comfort to the families left behind by knowing that their loved ones will be forever honored and remembered and to create an enduring symbol, recognized by the world, of the human sacrifice that occurred on that day in 2001. Proceeds from the sale of this 9-11 Remembrance Flag goes to: The Voices of 911, The Cantor Fitzgerald Fund, The National 911 Museum Fund, The USO and The Wounded Warrior Project.